Recent comments on creating a uniquely Chinese “Christian theology” come amidst a crackdown on Chinese churches. A recent state-run media piece announced that the great Middle Kingdom is working on new ways of keeping Christianity Communist Party-friendly. The Diplomat has written previously about Christianity’s growing numbers and China’s occasional Christian crackdowns. While growing numbers of Christians present a problem for the Party, the CCP’s solutions remain the same. The man at the heart of the China Daily piece (and the one responsible for keeping Christianity placid) is one Wang Zuoan, who said, “The construction of a Christian theology should adapt to China’s national condition and integrate with Chinese culture.” He also added that Chinese Christian theology should “be compatible with the country’s path to socialism.” Wang is not a priest, cleric, imam, or monk; he is the director of the State Administration for Religious Affairs. Wang and the Party’s position on religion has been made very clear: they want a cure. In 2013, Wang said, “For a ruling party which follows Marxism, we need to help people establish a correct world view and to scientifically deal with birth, ageing, sickness and death, as well as fortune and misfortune, via popularizing scientific knowledge.” He added, “Religion has been around for a very long time, and if we rush to try to push for results and want to immediately ‘liberate’ people from the influence of religion, then it will have the opposite effect and push people in the opposite direction.” Many would echo those sentiments, but the question is how hard is China going to “push” to “liberate” its citizens from religion. While China has an infamous reputation for having an iron grip on religion, it’s not as strong as it once was. As the peerless Tea Leaf Nation pointed out in April this year, Christianity and religions in general pose a threat to the mass line. Oddly, it seems easier to talk about Christianity than about the Communist Party in China’s warped online world. Just as Henry VIII declared himself the head of the church in England, the Communist Party is the head of, well, everything. The only recognized, legal path to Christianity in China is via the Three-Self Patriotic Movement (TSPM), run under the trinity of self-governance, self-support, and self propagation. The organization is central government affiliated and exists under the National Committee of the Three-Self Patriotic Movement of the Protestant Churches in China. 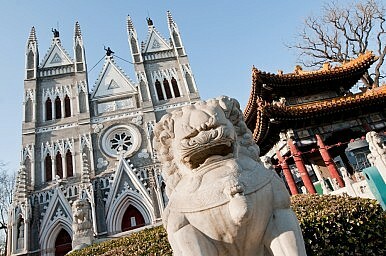 The growth of Christianity in China has recently drawn Beijng’s attention. A gorgeous church in Wenzhou was demolished; other churches in Zhejiang were forced to remove crosses from their exteriors. Resistance from local congregations eventually led to bloody violence. Even the state-sanctioned churches went in the firing line last month with a ridiculous 12-year sentence for TSPM pastor Zhang Shaojie for his peaceful advocacy. These are the early casualties in Beijing’s renewed interest in Christianity. Whether they are hiding in house churches around the country or in the state sanctioned churches, Christians around China can only take solace in the fact that — while the government is slowly trying to hijack their religion — the people in charge of doing so are the same ones that tried to outlaw reincarnation without permission.